Mckenzie Lacroix: You Can Try Out Fitness Trackers For Just $20! You Can Try Out Fitness Trackers For Just $20! A company named Lumoid makes it possible for those interested in tracking their fitness efforts, to try trackers before they buy. 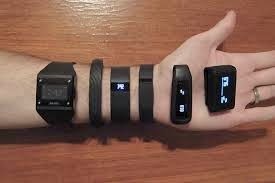 For just $20, one can obtain a Wearables Box containing 5 brand new fitness trackers of their choice, (25 to choose from), to try out for a week. When the week is up, you'd return the trackers to Lumoid with the return label supplied by the company. If there is one (or more) that you would like to keep, you pay retail for the tracker(s). This is such a convenient concept! Beats purchasing a tracker and returning; sometimes facing restocking fees. Or even worse, purchasing and keeping an item that you will never or barely use. Plus, you have the chance of testing 5 trackers all at once, side-by-side... Daily. Options is a beautiful thing. Always.